The R220 label and shrink sleeve unwind is ideally suited for supplying labels and shrink sleeves to all Quadrel Labeling Heads and Shrink Sleeve Systems. Labels are unwound into the label bin and pulled out of the bin by the labeling head. When the bin is empty, the R220 unwind system fills the bin automatically. 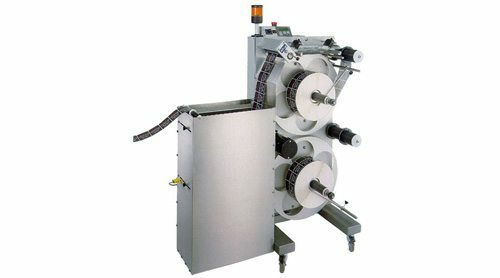 As the label supply depletes, the remaining portion of the label roll is unwound into the bin and a warning indicator illuminates to inform the operator to prepare a label splice; all this happens while the labeling system remains running.